Suggestion to check out Imagine, made by Chocobito if I am not mistaken, had been sitting in my Skribit list for some time. Frankly situation with image viewers is boring. There is XnView camp, IrfanView camp, ACDSee camp (I think they fell asleep) and rest who hadn’t got to any (yet). So does Imagine offers anything worth of establishing new camp? Imagine has everything needed to view images. 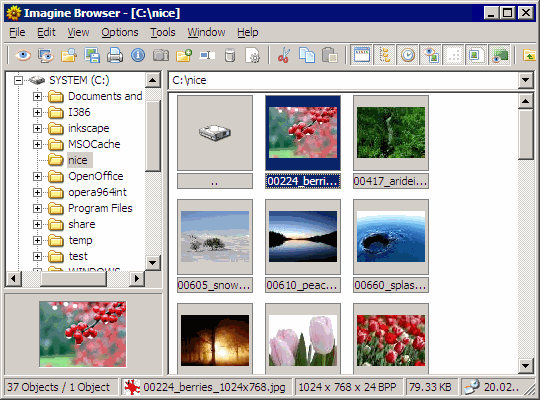 It acts exactly as any popular image viewer – fast, responsive and not shy to offer additional functions. Problem is – there is no catch. Imagine does what others do. Not worse, but not really better either. Nice features yes, interesting – hardly. I tried to do some usual image-viewing tasks in IrfanView and Imagine side by side. Hardly any difference. Skimming menus shows comparable amount of extras as well. Only feature exclusive to Imagine is viewing images inside archives without unpacking. But on ~100Mb archive it was too slow to be relevant. As for speed Imagine reports ~60-100ms for opening 1024×768 image, while IrfanView says ~30-40ms for same. Not a fact that they measure same speed (including/excluding interface refresh, etc) and there is no difference for human eye anyway. Imagine is excellent app released as freeware/donationware that works without installation (creates some stuff in user profile folder). With only problem that it sits in niche long split between other excellent apps that do same things. Hi, you are right, I put this program in Scribit :) ,I found it a interesting viewer, I like the very fast zoom with resample,in Irfanview zooming a image with resample its really low. In overall I choose Irfanview but Imagine its a good alternative. Imagine is good alternative but hardly an innovator. Love reading your reviews. Always meaningful and highly amusing.